For patients battling chronic hepatitis C (HCV) infection, the advent of direct-acting antivirals (DAAs) in 2014 might have felt like the battle against the debilitating disease had been won. However, as a widely-publicized study released in June made clear, many patients are handed a prescription for DAAs only to find out that getting a prescription is only half the battle. For some, the biggest challenge is actually getting their treatment costs covered by insurance. According to the study, which ran in Open Forum Infectious Diseases, insurance companies deny coverage in 35.5% of cases. For those with commercial insurance, the denial rate is even higher. 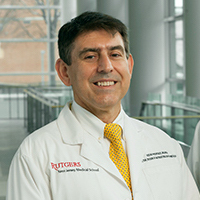 Nikolaos T. Pyrsopoulos, MBA, MD, professor and chief of the Division of Gastroenterology and Hepatology at Rutgers-New Jersey Medical School, said in an interview with MD Magazine® that those denials are a major blow for patients, knocking them from optimism to outright anger. 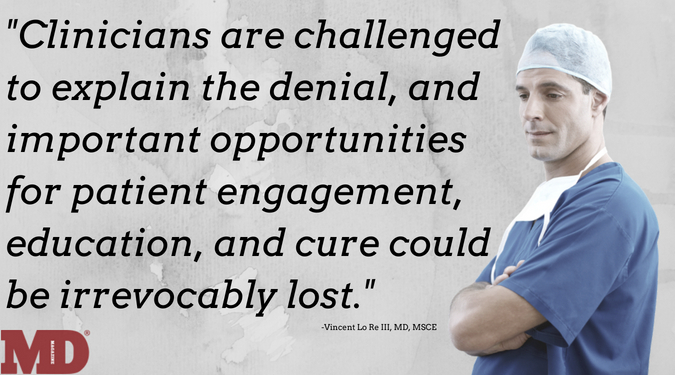 Vincent Lo Re, III, MD, MSCE, an associate professor of medicine at the University of Pennsylvania Perelman School of Medicine, and the author of the study detailing DAA denials, said the data generated significant concern in the medical field. Despite the drug class’ capabilities in eradicating infection in 95% of all treated patients with HCV, insurers continue to “ration use of the drugs, presumably because of their high cost,” he told MD Mag. Such high rates of denials call into question whether the US has the ability to eliminate HCV as a public health problem—despite the country’s scientific know-how, Lo Re said. The data behind the denials is complex and, at times, contradictory. Overall, commercially insured patients were denied coverage 52% of the time, Medicare-insured patients were denied 35% of the time, and Medicaid patients were denied just 15% of the time, according to Lo Re’s study, which was based on prescription data from between January 2016 and April 2017 from Diplomat Pharmacy, Inc., a national specialty pharmacy. But earlier studies published in 2016 suggested the denial rate was far lower. What Lo Re’s findings may have actually uncovered were physicians’ attempts to treat patients with chronic HCV who have “have less advanced liver fibrosis, have not met sobriety restrictions, or have not had consultation with a specialist,” hindering their coverage qualifications. Notably, those studies reported far higher rates of denials for patients on Medicaid. Lo Re and colleagues said that likely changed after the Centers for Medicare and Medicaid Services (CMS) sent a letter to state Medicaid officials is in 2015 indicating that denying treatment due to cost concerns violated federal law. DAAs generally cost between $50,000 and $100,000—sometimes more—for a 12-week regimen. The letter, signed by Alissa Mooney DeBoy, MPH, then-acting director of CMS’ Disabled and Elderly Health Programs Group, stated that while states have the right to place reasonable restrictions on drug coverage, they are not allowed to restrict access simply because of the list price of a drug. “As such, the effect of such limitations should not result in the denial of access to effective, clinically appropriate, and medically necessary treatments using DAA drugs for beneficiaries with chronic HCV infections,” DeBoy wrote. That letter led to lawsuits and threats of lawsuits against states that were rationing DAAs, which eventually resulted in better coverage of DAA therapy for patients with chronic HCV. However, that did little to help the 56% of Americans who are commercially insured. Patients whose insurers won’t cover DAAs have few other options. Part of the problem, Lo Re explained, is that earlier, interferon-based therapies for HCV are no longer recommended by guidelines. “Patients who are denied direct-acting antiviral therapy for chronic HCV infection by their insurer are not typically prescribed older therapies, since these regimens are associated with considerable toxicities,” he said. Sometimes those denials are because the insurers do not believe the disease is advanced enough to warrant such a costly treatment. But research has shown waiting until the development of advanced hepatic fibrosis/cirrhosis in patients reduces the eventual effectiveness of DAA treatment; one study found it increases the risk of liver-related death five-fold. Lack of DAA treatment can also cause a host of other health concerns, Lo Re said. “Patients denied access to new DAA therapies may have continued progression of hepatic fibrosis and remain at risk for the development of cirrhosis, end-stage liver disease, and hepatocellular carcinoma,” he explained. Beyond the direct health consequences, Lo Re said denials could also undermine the physician-patient relationship. While the medical benefits of DAAs are not in doubt, the solution to the problem of access is a matter of much dispute. Drug companies note that it can cost billions of dollars to bring a new therapy to market—money that must be recouped through pricing. And Lo Re found that cost-effectiveness studies prove the high price tags are still a good deal for insurers, since curing chronic HCV allows patients to avoid other serious and costly health problems. Meanwhile, insurers argue that pharmaceutical companies are charging too much for the therapies. In July, the board of the health insurance trade group America’s Health Insurance Plans, released a statement supporting efforts by President Trump and some members of Congress to lower drug costs. While patients wait to see if government intervention will affect pricing, Pyrsopoulos said he personally is seeing more success getting patients covered. While his in-house denial rate historically matched up with Lo Re’s findings, it’s changed in the past 4 months as insurers have expanded access. Sometimes, though, it takes extra work. He said these appeals are usually resolved in 30 days or less. There’s an option to file a second appeal in many cases, but Pyrsopoulos opts to respond to denied appeals by going directly to New Jersey’s Department of Banking and Insurance, where he said their success rate is seemingly perfect. A last resort for patients who are denied—or a first resort for those who aren’t insured at all—is to ask the drug manufacturer to provide the therapy for free via the company’s patient assistance program. “In the majority of our cases, the companies provided assistance,” Pyrsopoulos said. Sometimes insured patients whose insurers agree to cover the therapy but only with an very high copay are also given help from drug companies to lower that copay cost. Ultimately, though, even as the direct-acting antiviral story plays out in a series of denials and approvals for individual patients, Lo Re and Pyrsopoulos said the bigger story is one of a country that now has the tools to eradicate or nearly eradicate a disease that affects an estimated 3.5 million Americans. The question is whether the US would be able to turn that opportunity into a reality.